For the analysis of polar molecules with GC, derivatization is always needed. Although this step in the whole sample preparation is not difficult, it is time consuming. Therefore automation of derivatisation is very useful to reduce cost and analysis time. In recent years, ATAS GL developed an automated derivatisation procedure for molecules containing acids and/or alcohols. Because of the good performance of the injector and de-activated liners, the whole derivatization procedure can be performed inside the injector. 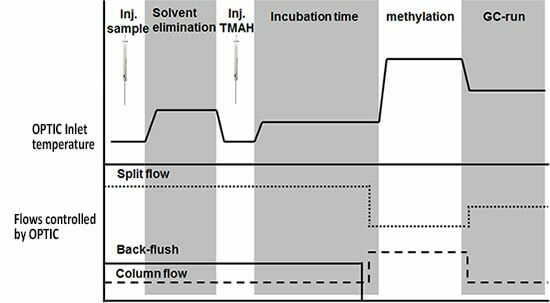 The automated in-injector derivatisation method can be performed without any modification to your GC and no special autosamplers are needed; only an OPTIC-4 inlet and special available liner are needed. The in-injector method is nowadays already applied to several applications, for example fatty-acid profiling, analysis of sugar and/or carbohydrates and phenolic acids in food, raw materials and biological materials. Example of fully automated in-situ thermochemolysis steps.